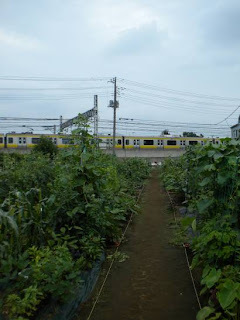 Scattered amongst the farms and vegetable stands in our neck of Tokyo there are, thankfully, a handful of community gardens. Bustling places, the plots measure roughly three meters by three meters, and gardeners undoubtedly make the most of the space allotted to them. Last year, we noticed a farm literally just paces south of the train tracks partitioned in half. (The photo at left of a passing train was taken standing about three-quarters of the way to the end of the garden space.) Fearing the worst (another high rise or series of prefab homes) we waited with baited breath. 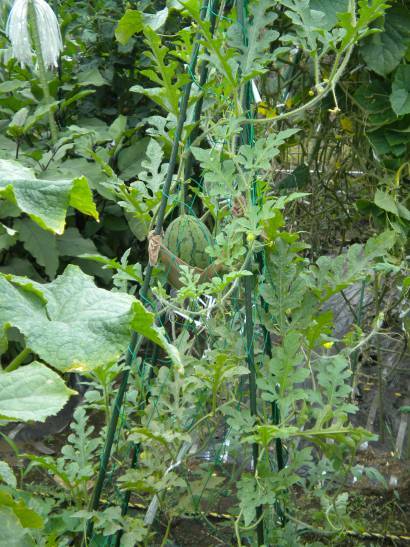 Much to our pleasure, this most fantastic community garden was born! We've watched its progress over the course of the past few months - plowing, marking, planting, and now tending - with great pleasure. Last Sunday we ventured in for a look around, and here's a bit of what we found. A personal favorite because I dearly love its cold, crisp taste in summer is this watermelon tee-pee. The best part? The adorable fruit cradled in a hammock made out of old stockings. If that's not true love, I don't know what is. 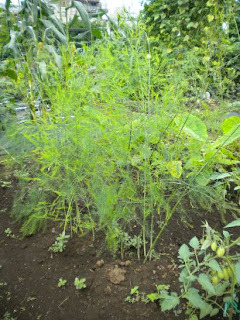 A tiny bed of baby asparagus that speaks to me of a long-term commitment to the space, optimism, and tasty spring meals. 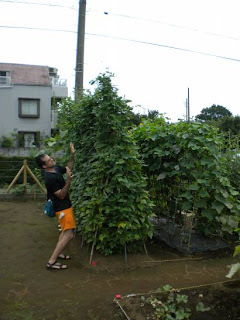 One of the largest bean trellis' ever! I made my favorite spouse stand in for scale, and he truly feared an attack from those vines. 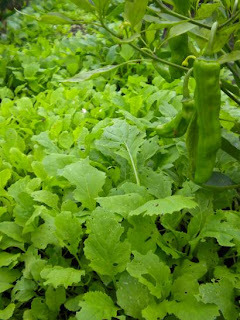 Hot peppers growing in a bed literally covered with what looked like arugula. I assumed it was bad form to sample uninvited from someone else's garden, but I thought it a quite clever idea for a living mulch. Plus, I imagine the bright red of the pepper with those brilliant green leaves will be as much a delight for the eye as it is for the tummy. 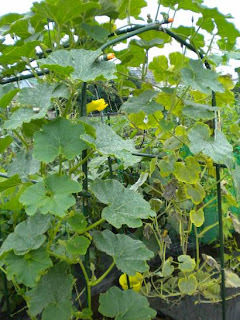 A squash trellis not quite as big as one spotted at a nearby farm, but still quite a good one. Based on the manic state of my own squash, I may try something like this next year. Love viewing Tokyo from Cork. Thanks, Claire! Glad you're enjoying it. And nice to know you're out there, too! Someday I hope to make it to your fair isle as well.